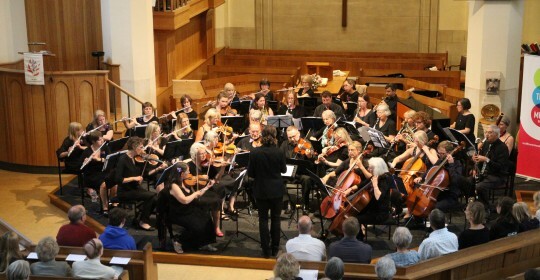 Sunday 25th June was the third annual OTMB Orchestra Concert in aid of Music Space but the first at Redland Park Church and the new venue in such a good location worked really well. I began the evening by thanking the audience for choosing us over the last night of Glastonbury! Looking out and seeing such a good sized audience was an inspiration to everybody on stage and meant that we hit the ground running right from the off with the Pirates of Penzance Overture, followed by Bach’s Suite No. 3 which was full of vitality before closing the set with a crowd pleasing rendition of Spring from Vivaldi’s Four Seasons. We were then treated to two sets of music from The Oakwood Ensemble and The Flute Ensemble, both offering much musical contrast and interest. The first half closed with a barnstorming performance of the La Gazza Ladra Overture from Rossini before a very energetic Slavonic Dance No. 3 by Dvorak. At the interval some of the orchestra members were kind enough to organise refreshments with all proceeds going to Music Space and having this at half time really added to the sense of occasion and the relaxed atmosphere of the evening. The second half started with Andrew Pearson, one of our viola players talking very movingly about how Music Space has touched his life and the immensely positive impact it has had on that of his son Alfie and you could see how his words were connecting with the audience. Then followed a very tuneful version of Here Comes The Sun from The Clarinauts followed by Peter Warlock’s Capriol Suite from our string section, otherwise known as ‘Highly Stressed Strings’! The orchestra then closed the show with two movements from Mozart’s ever-popular Eine Kleine Nachtmusic, playing the Rondo and Serenade with great skill and lightness of touch. After thanking the audience for coming and pointing out that there was still time to get home to see Ed Sheeran headline the Pyramid Stage (!) we had one more up our sleeve; The Dam Busters March. I was at great pains to point out that this was in no way a political statement! All in all it was a really enjoyable evening, with the orchestra definitely playing its best yet and at its most assured of all our concerts so far and with the audience playing their part as well. You can see photos on our Facebook page and videos on our YouTube channel.